The Trisar 2 D is a great geodesic tent with 2 doors and porches. The 'inner pitch first' design provides extra stability and great protection from all but the worst of the weather. The freestanding format also makes this tent ideal for camping where the ground is less firm, as it doesn't rely on guy lines and pegs to support its main structure. 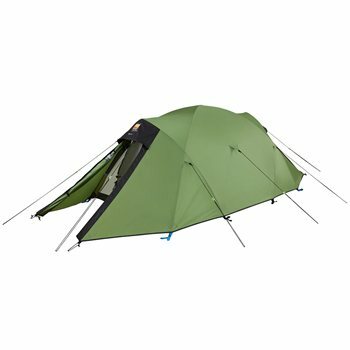 This 2 man tent has been designed for year round backpacking trips and is also well suited for group, Duke of Edinburgh Award or Scout use in more exposed conditions. The Trisar 2D has front and back ventilation and both vents can be adjusted from the inside of the tent. The flysheet doors are particularly versatile - opening from the top, bottom or fastening at the side, allowing you to cater for changes in weather and weather direction. With 2 porches, the Trisar 2 D offers flexibility for gear storage and access. The Trisar range uses Wild Country Superflex alloy poles and tried and tested Wild Country high performance flysheet and groundsheet fabrics.Groundsheet protectors (footprints) to prolong the life of the tent and help keep it clean can be purchased separately. I'm very happy with this tent. However this is based on very little use as I have just purchased.Its light, easy to set up and the two sided entry is useful. I also bought the footprint for this which I would recommend as it gives a floor to the porches.I would use camping world again.